At the northernmost point of the Chesapeake Bay, the Susquehanna River flows south into the bay and meets the tidal flow, causing hazardous conditions. Concord Point Light was built on this spot in 1827, a 36 foot tower with 3 foot thick granite walls. The lantern was originally lit with 9 whale oil lamps with 16 inch tin reflectors. 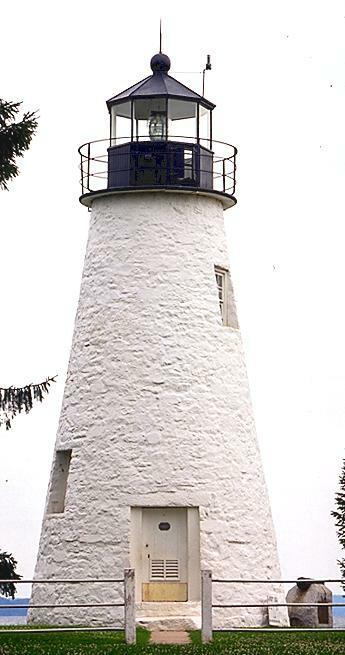 In 1854 a sixth-order fresnel lens was installed, and this was eventually upgraded to a fifth-order lens. Many generations of the O'Neill family served as keepers at Concord Point from 1827 to the mid-1900's, starting with John O'Neill, who defended this site during the War of 1812. One of the "potato canons" from that era still stands guard near the light. Concord Point Lighthouse was decomissioned in 1975 and is now maintained by the Friends of Concord Point Lighthouse. Extensive restoration began in 1979, and is ongoing, with plans to turn the old keeper's dwelling into a museum. 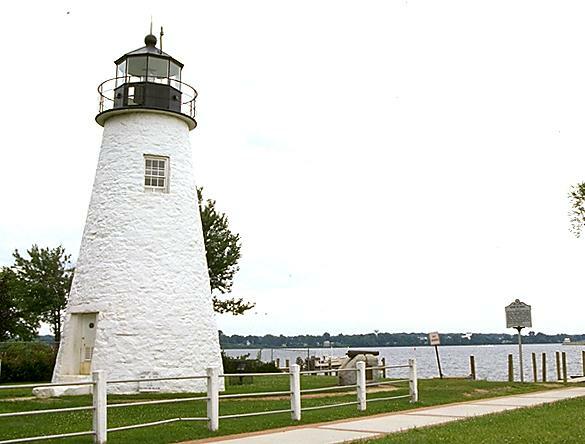 Havre de Grace is a charming town with Colonial flavor. Instead of zooming by on I95, take some time to stop and visit. There are some great restaurants along the water to have lunch or dinner after visiting the lighthouse. The tower is open to visitors afternoons during May-October from 1-5 Saturday, Sunday, and holidays. The grounds are open year-round.